American Outdoors Coolers are the best soft-sided coolers in the industry. Don't be fooled by lesser priced imitation coolers made to look like AO Coolers. 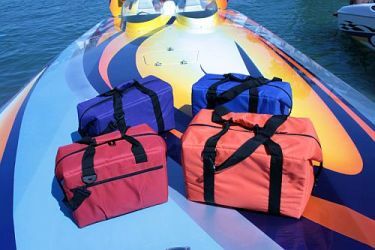 American Outdoors was the first to introduce these innovative coolers close to two decades ago. AO coolers are guaranteed to never leak or sweat because of our high quality vinyl liner. It is the same material used to make waterbeds and above ground pools. The inner insulation is three-quarters of an inch thick, high-density, closed cell foam. The combination creates a cooler that will hold ice for 24 hours in 120-degree heat. With our soft exterior, it won’t scratch up your gel coat or tear up any upholstery. Because of our confidence in this product we guarantee the coolers for life! If it ever leaks we’ll replace the liner. Tested, used, and sold by many of the performance boating industries and top manufacturers. This cooler will be the best cooler you will ever purchase.